Abby Knight only had one worry in the world and that was to remember to add the name “Salvare” to the end of hers. Life was good and being married to Marco made it even better. After their honeymoon to Key West, settling down in New Chapel for a lifetime of wedded bliss was perfect. It almost seemed providential to have been clunked out of law school and dumped by Pryce Osborne II (thank goodness!). With their three-legged canine, Seedy, they would make a perfect family. Now if she could only keep Marco’s mother, Francesca, from reorganizing her flower shop, Bloomers, and her mom, Maureen “Mad Mo” Knight from trying to sell her creations there, she’d be all set. Marco’s only problem concerned plumbing in the basement of Down the Hatch Bar & Grill. Abby and Seedy headed down to check out the latest fiasco. Seedy decided she’d help out the gang by digging up the dirt floor. After all, Stan had already dug up most of it. The real fiasco began when Seedy presented Abby with a little “twig” as a result of her dig. “Marco, that’s not a twig. That’s a finger bone.” Clogged pipes were one thing, but skeletal remains were quite another. It wouldn’t be long before crime reporter Connor MacKay showed up for the scoop and Seedy unearthed yet another clue. This whole mess was going to make Maureen’s latest creation, “Nutter and child” look good in comparison. Just who was lying in that dank, dark basement? Convincing Marco to take on the case with her wasn’t going to be easy, but doable. Clues were pretty sparse, but there was an “arc-shaped indentation” in that skull, an old key ring to go on, and the mysterious disappearance of Kermit Cannon years ago. Parthenia Pappas, a loose cannon, who had been seeing Kermit and Rusty Miller, who once owned Down the Hatch, were telling taller tales than Marco had ever heard in that bar. New Chapel dirt was being unearthed by the truckload and things were beginning to disappear, including those bones! Abby Knight Salvare is once again digging up mounds of old dirt and bones. There are great touches of humor in this cozy mystery, but also a good, solid plot. Cousin Jillian is on hand for a few laughs, as usual, but I really liked the layer upon layer of mysterious clues Abby had to unravel. This was as if Discovery ID entered the cozy mystery world and no one was going to find out whodunit until the last minute. 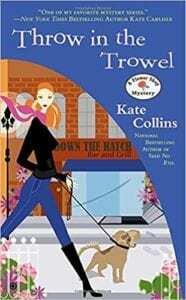 Kate Collins was dangling little clues in front of me until I was practically convinced I knew not only who those bones belonged to, but also who clunked that corpse on the noggin with that trowel. Wrong. And then there’s yet a new PI in the making in this one! Quill says: Everything's coming up roses and bones in this fabulous Flower Shop Mystery!